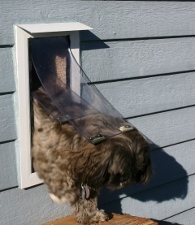 Installing your dog door in the wall uses a tunnel (through the wall) and two flaps, one outside and one inside. Wall installations are the most energy efficient configuration due to the air space between flaps, especially with an extra large dog door. Wall model cat and dog door manufacturers have a wide range of materials that make up their pet doors. Below, I'll review which materials last longer, are easier and safer for your pet, and give superior results. Metal electronic dog doors open via a radio transmitter on an animal's collar. When the transmitter gets close, the door opens. It sounds like a great idea, but they don't always work as expected. Sly cats often sneak through with the dog and get stuck outside with no transmitter. The door opens anytime the dog nears the door, not just when they want outside. The door might even close as the dog heads out, sees rain, and wants to go right back in. Electronic dog doors also give a false sense of security as an intruder could coax a dog to the door to open it. Hard acrylic flaps, either single or split, close better than lightweight flaps. Dogs are often reluctant, however, to push through the hard dog door. A dog might also get their head caught if they try to back up midway through, often scaring them enough not to use the dog door again. The best cat or dog door flaps are made of heavy 3/16" PVC vinyl. High quality vinyl is flexible in the coldest weather and holds up to heat and sun. Clear vinyl dog door flaps let your pets see where they want to go. Black or white flexible dog door flaps are available if incoming daylight or privacy is an issue. Magnets and strikes hold the pet door closed when not in use. The material, number and strength of the magnets determine whether your cat or dog door is energy efficient in foul weather. Alnico5 magnets paired with stainless steel strikes along the sides and bottom of the door make the best combination. Security is a major factor in choosing a wall model pet door. Higher quality doors offer security covers that mount on the inner frame. The best security covers are made of Lexan® polycarbonate or Starboard® marine grade polymer. These materials are strong, attractive and virtually indestructible. Starboard® even has color that goes all the way through so scratches don't show. Keep in mind, if you want your pet door installed under an obstruction like a window sill, you need a special wall model with a side load, instead of top load, security cover. Locking mechanisms also vary on wall mounted dog door security covers. Some doors use a spring lock that fits into a groove at the top. Spring locks don't always stay locked and the spring can get loose and scratch your interior wall. Pin locks with a positive spring action are better since they won't scratch and can be padlocked if desired. Wall model cat and dog doors have both inner and outer frames. A strong frame is essential to secure both the flaps and the security cover. Plastic frames are cheaper, but lack the strength and longevity of metal. Heavy extruded aluminum at least .063" thick makes the longest lasting pet doors. Pet door tunnel materials vary by manufacturer. Telescoping tunnels are easy to install, but can allow water to enter the wall. The best pet door tunnel design is a one-piece .040" aluminum tunnel riveted to the interior frame. It will be custom fit to your wall during your dog door installation. Carpet should cover the bottom and sides of the tunnel for a slip free, safe surface. Complimenting your home's appearance when installing a dog door in your wall is easy with the right frame, flap, and cover colors. The right colors can mean the difference between your wall dog door being an asset or detriment to your home's décor. The best wall pet door warranty I've seen is 5 years and covers all parts including a pro-ration on dog door flaps. Some manufacturers have a longer warranty, but don't cover the part that is most apt to wear, the flaps. A high quality wall pet door should give years of trouble free service.